One of the things I love about traveling to another country is experiencing how people use everyday things in different ways. When Marcus and I traveled to Italy in 2008, the apartment we stayed at had a dual-flush toilet; as in, you push one button to flush away pee (less water) and a different button to flush away poo (more water). They were the coolest toilets ever! When we moved into our townhouse that summer, we noticed that our toilets were your basic, contractor-choice models. Even though they were low-flow and still in good shape, we knew we could save more water (and hence more money on our water bill) if we switched to a dual-flush model. Even though we believe in the motto “don’t fix it if it ain’t broke,” we also believe in the Super Frug strategy of spending some money today in order to save more money in the future. It took us over a year to get new toilets–you know how life goes–but, we did our research and found a store in Seattle that offered a good selection of water-saving, low-flow, dual-flush toilets. We decided on the Caroma “Sydney Smart” toilet. We needed two: one for the powder room and one for our bathroom. They cost $350 each, and with a Chinook book coupon for 10% off, the total was about $690. The toilets weren’t cheap but we knew that we would make the money back in water bill savings in the long-run. To save money, we transported them and installed them ourselves. 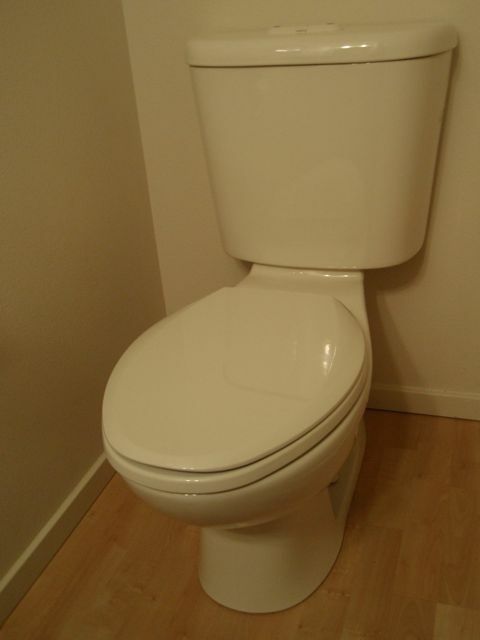 In case you’re wondering, we gave one of our old toilets to friends who were redoing their bathroom and we sold the other one on Craigslist (cha-ching!). Our old toilets were low-flow and used 1.6 gallons of water per flush. Our new toilets used 1.28 gallons for the poo flush and only 0.8 for the pee flush. That meant that for most of our flushes, Marcus and I were only using half the amount of water that we used to use! That’s a lot of water saved, which is great for the environment and great for our budget. Before we installed our new toilets, our average two-month water and sewer bill was $131. After we installed our toilets, our average bill dropped to $94. That’s a savings of $37 every two months. Which is a savings of $222 per year. Over ten years, we will save $2220. Subtract the $690 we spent on them (took 3.1 years to pay them off) and that’s still $1530 saved over ten years, not to mention all the water saved too. And that is why dual-flush toilets ROCK! This entry was posted in Home by Peg. Bookmark the permalink.